Yet, there is little media attention given to much of what he has done. Of late, the media is focusing almost exclusively on Obama’s critics, without holding them responsible for the uncivil, unconstructive tone of their disagreements or without holding the previous administration responsible for getting us in such a deep hole. The misinformation and venom that now passes for political reporting and civic debate is beyond description. As such, there is a need to set the record straight. 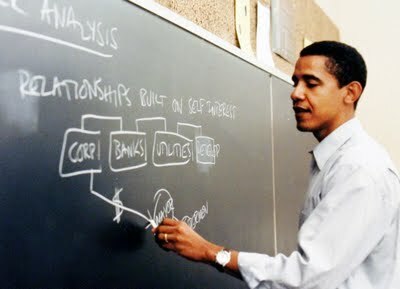 What most impresses me is the fact that Obama has accomplished so much not from a heavy-handed or top-down approach but from a style that has institutionalized efforts to reach across the aisle, encourage vigorous debate, and utilize town halls and panels of experts in the policy-making process. Beyond the accomplishments, the process is good for democracy… and our democratic processes have been battered and bruised in recent years. Here is a list of Obama’s accomplishments as of August 2009. 90. Has announced his intention to push for education reform. Oh, and he built a swing set for the girls outside the Oval Office! 91. Signed the Lilly Ledbetter fair pay act. 92. Discovery and publicizing of Medicare fraud, making the public more aware of not turning a blind eye to such fraud. With his list of 90 accomplishments, Dr. Robert P. Watson of Lynn University in Boca Raton, Florida, has graded Barack Obama on his first six months in office. I think the list is invaluable even though, as a progressive, I don’t believe things are quite as rosy as Dr. Watson’s inventory might suggest. For instance, I have been extremely disappointed with the president on health care reform and was completely shocked when he took single payer out of the mix from the very beginning. Even I, an unseasoned political person, did not (and do not) trust health insurance, big pharma, and AMA to make our costs less expensive. I wholeheartedly agree that defending Obama on effectively false grounds will help neither him nor us. But I believe the list can be helpful, as a starting point for analyzing his presidency so far. He has certainly disappointed us in a number of areas, but I do think it important that we acknowledge his positive actions. Let’s add to the list as more accomplishments come to light. And if we think certain items are misleading, we can make note of them. We’ll send him The Rag Blog with our additions. I am saving the list in a file and using appropriate parts for different blogs. For example, in the Lubbock paper there was recently a comment about President Obama not being deserving to be Commander-in-Chief of the military. I went through the list and picked out all of the items that pertained to what he has done for our soldiers and their families and posted them in the comment space. Some of these items I was already aware of, some I was not. Although I knew that the president had lifted the veil of secrecy (with appropriate family permission) over the returning war dead that had been established by both H. W. Bush and G. W. Bush, I was not aware that the expenses for families of the fallen soldiers are now covered so that they could be at Dover A.F.B. when their loved ones came home (#5). I am also grateful that he is phasing out the “back-door draft” caused by the stop-loss policy that kept soldiers in Iraq-Afghanistan longer than their tours of service (#12). I believe that numbers 1, 2, and 9 were instrumental in exposing the Medicare fraud recently publicized in Florida. Even though I was aware of the rules limiting lobbyists in the White House (#10, 11), I am glad to be reminded and to have them in a list that I can go to for reference. I read certain newspapers and blogs religiously, and will use the various items in the list to support my arguments against the propaganda perpetuated by other bloggers who merely repeat pundits’ talking points. I am so tired of the swiftboat types cherry-picking words and using them as sound bites that I try to back my statements with examples (such as what he has attempted for the military). The sound bite I hear the most in my part of West Texas is that President Obama says we are “no longer a Christian nation.” FactCheck.org has the quote from his speech that says we are “no longer JUST a Christian nation,” but that doesn’t mean a thing to the groups I am addressing. Note that I’ve added a couple of items at the end. This is the sort of public discussion we need. Somebody posted a comment, really a question, recently at an online discussion about efforts to prosecute Bush & his gang for war crimes and crimes against humanity, relating to the illegal invasions of Iraq and Afghanistan. The question was, should we hold Obama to the same LEGAL and MORAL standards? if Obama has already escalated the war in Afghanistan, and escalates it further, should he be prosecuted? No matter what else he does that deserves any approval, I say the answer to this question is “yes”. He should be prosecuted. We must hold him to the same standard. The highest international crime is the crime of military aggression. Bodysurferbob and Monty, come on you guys. Bobysurferbob, Monty is NOT a tea bagger, but Monty you are being excessive in your position. Both of you calm down. Hey guys- can’t we compromise and go after Kissinger before it’s too late? Is Kissinger even still alive? Part of the point I believe, is that the corporate media downplays Obama’s accomplishments, otherwise the real tea baggers might get confused. How could you call the prez a ‘traitor’ if you knew all the things he has done for the military? So, does he lose all his “accomplishments” as Monty suggests and be tried before an international tribunal for the Obamasurge in Afghanistan? (How Monty could call for that and ignore Kissinger, Cheney, etc is another question.) Bodysurferbob jumps too quick to incite a fellow leftist, acting or reacting emotionally off of Monty’s impractical stance, not simply explaining that Monty is over-reacting to the situation. Actually they both are. And this typifies the progressive community. There are those who are overly-defensive around Obama like bodysurferbob and then there are those who are overly-critical of Obama like Monty. Some kind of middle ground is more appropriate. Don’t be saying I “ignore Kissinger, Cheney, etc. )” I have consistently called for their prosecution for war crimes and crimes against humanity. I am glad that Kissinger has to be careful which countries he visits, because he could be arrested on standing warrants and prosecuted for his crimes against the people of Indochina. It is disgusting that we cannot arrest him here in the USA for it. Similar disgust applies to Bush and Cheney and their gang not being arrested already. Many others who should have been prosecuted are already dead. Shame we can’t still prosecute LBJ and Nixon. Estimates are that between 2 and 3 MILLION Vietnamese were killed by them. You can’t give your “friends” a free pass for all their good “accomplishments” when they lie and bomb and murder people for the sake of our Bankster American Empire. Obama is commiting war crimes by continuing the illegal war against the people of Iraq (instead of ordering an immediate and unilateral cease fire and withdrawal of our forces) and by escalating the illegal war against the people of Afghanistan and by escalating the acts of war against the people of Pakistan. And we also ought to be talking about what his administraiton is doing in Colombia and Honduras. If you have a problem wrapping your head around these facts, don’t assume the rest of the world has the same problem. And don’t think you can get away with dismissing as “impractical” the need to condemn Obama’s criminal conduct. Defending Obama on the basis of his good deeds in the face of these growing crimes is NOT going to help save us from the growing fascist movement. It will instead undermine our ability to make any credible case for any progressive position on EVERY issue. And that includes our ability to defend Obama (and more importantly, to defend ourselves and everyone) against the racist and fascist attacks we are seeing. We can’t be effective if we are hypocrites. We can continue to support Obama (and everybody else too) whenever he/they support a sane, decent position on an issue BY VOICING SUPPORT FOR THE POSITION, NOT THE PERSON. Politics is not one dimensional. i love it when the rag publishes these kinds of articles. there is NOWHERE in the local media market where you can read this sort of analysis… even when i disagree. certainly nothing like this is happening in the print media: you’ve got the UT rooting for imperialism and oppression; the Reader hoping to dull your senses so you won’t notice what’s going on; the City Beat which pretends to be progressive and can’t be bothered to act like it. Newer Article: Reader Rant: America is the richest country in the world but Americans can’t afford to live here.